Our sky chart shows the eastern sky for around mid-evening at mid-northern latitudes in North America, with the bright waning gibbous moon shining between the Pleaides star cluster and the star Aldebaran, the constellation Taurus’ brightest. Mid-northern latitudes elsewhere around the world will see the Pleiades and Aldebaran in the same place in the sky at the same hour of the night – yet the moon will be positioned somewhat differently relative to these two stellar signposts. The farther east you live of North America, the closer the moon will appear to the Pleaides in tonight’s evening sky. In Europe, you will still see the moon between the Pleiades and Aldebaran, but noticeably closer to the Pleaides. Farther east – in Asia – you will see the moon almost pairing up with the Pleiades cluster. If the lunar glare proves too much, try viewing the Pleaides with binoculars. The same thing applies to the southern hemisphere. The farther east you live of the Americas, the closer the moon appears to the Pleiades cluster. 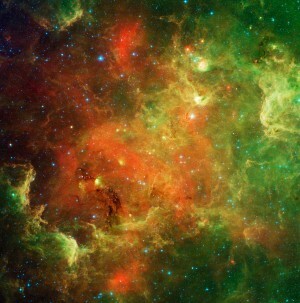 However, the moon, Pleiades and Aldebaran rise considerably later in the evening at more southerly latitudes. Also, the southern skies see the Pleaides and Aldebaran lining up more horizontally relative to the eastern horizon. The moon, Pleiades and Aldebaran bedeck the eastern sky by mid-evening in the northern hemisphere and by late evening in the southern hemisphere. 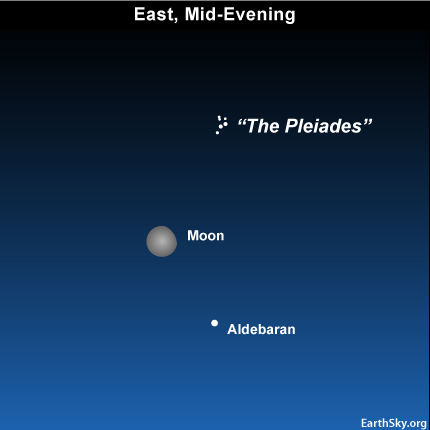 Look for the moon somewhere between the Pleiades and Aldebaran tonight! Site contents copyright © 2019 Recorder Online	except as noted. All rights reserved. | 85 queries in 1.183 seconds.